It was just about a year ago that I got a chance to do an interview with Mark Ragan after having done a presentation at a corporate communicators conference Ragan Communications cosponsored with SAS in North Carolina. Today Mark tweeted a link to his post about it on Ragan.com, but when I viewed it I saw it had an embed code that would enable me to post it here, I thought it would be good to cross-post. I’ve had a few opportunities to do return engagements, addressing groups to which I had previously made a presentation. Those are fun because they give me a chance to take stock, to see how we have progressed in the time between presentations. This video is similar for me in that regard, because it predates the launch of our Sharing Mayo Clinic blog and our active engagement in Twitter. 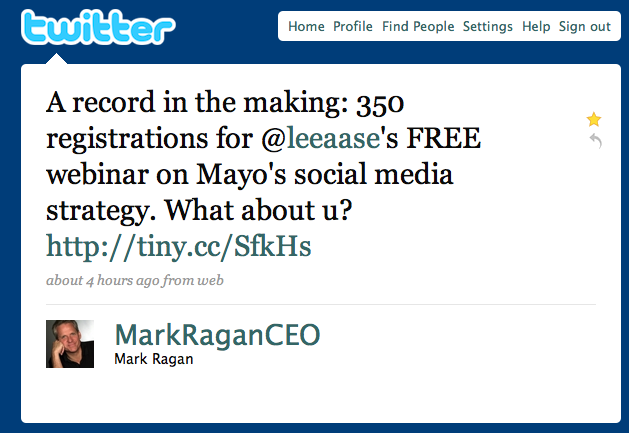 So it’s great to see how much has developed further in our Mayo Clinic social media efforts. It’s also fun to see that the screen shots of SMUG that Ragan showed in the video are from the days when this blog was operating on WordPress.com instead of a self-hosted version of WordPress. One of the advantages of the self-hosted WordPress is that I’m able to embed the video you see above; on WordPress.com you have much more limited options for embedding video, so if I were doing this post a year ago I would have only been able to link to the Ragan post instead of embedding. So it’s neat to see how far we’ve come, but also to see that the basic strategy outlined in the video above hasn’t changed. 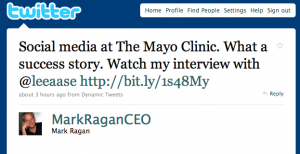 And just last month, almost a year to the date after I talked with Mark at the SAS conference, we hosted a summit on social media in healthcare with Ragan at our Mayo Clinic campus in Scottsdale, Arizona. I’ve done some year-in-review posts previously (in 2006. 2007 and 2008) and will plan to do so again, but Mark’s tweet provided a nice opportunity for a quick look back. Tomorrow I’m excited to provide a look forward when I do the keynote at the Healthcare Internet Conference in Las Vegas. If you’re attending the conference, I hope to get to talk to you in person. Please to stop me and say hi. If you’re not going to be there in person, I think the tweet stream to follow will be #hcic. On Tuesday, August 4, I’m going to be presenting a free webinar, sponsored by Ragan Communications, on our Mayo Clinic social media experience. I have no idea what kind of record is in the making, or what the old record might be, but if you’re interested I hope you will sign up to join us. Please pass this along to anyone you think might find it helpful.